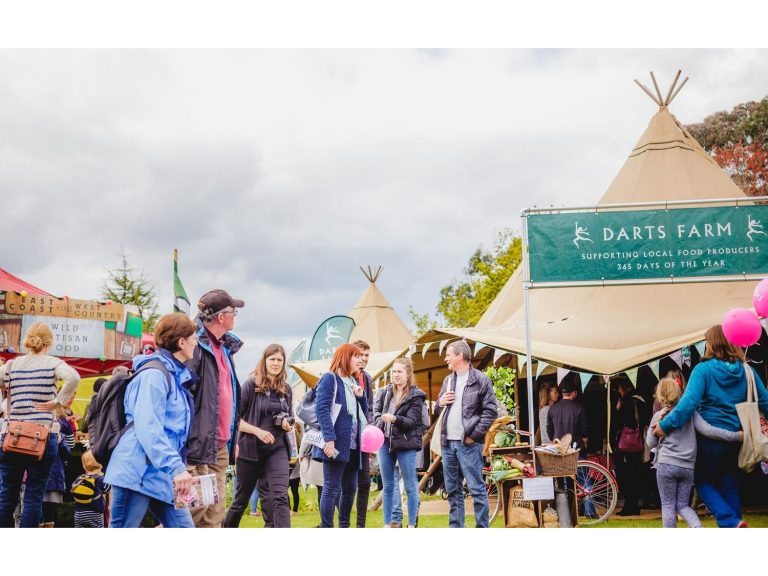 The early May Bank Holiday weekend saw Exeter’s Northernhay Gardens and Castle Courtyard transformed into a foodie’s paradise as the 14th Exeter Festival of South West Food and Drink sprang up. Crowds gathered to see hundreds of local producers, top chefs including Tom Kerridge, Michael Caines MBE, Simon Hulstone, Michael Wignall, Paul Ainsworth, Josh Eggleton and Mark Dodson, family activities, masterclasses and freshly cooked locally-sourced street food. For the first time in its history, the festival ran on the Saturday, Sunday and Bank Holiday Monday drawing thousands of food fans and families across the three-day weekend. The sunshine on Saturday saw crowds pack out the event while wet weather on Sunday did little to dampen the spirits of festival goers who turned out in force to see Tom Kerridge take to the cookery theatre stage with Michael Caines. The cookery theatre welcomed no fewer than six Michelin starred chefs on the Sunday, part of a seven Michelin starred line-up over the weekend - giving festival goers the chance to learn from the experts. Thousands chose to spend their bank holiday Monday at the festival, entertaining the family with Fun Kitchen cooking workshops, craft activities and bug-eating challenges. The party really got going at the After Dark Music Festivals with the Locked Horns and Bill Ding and the Skyscrapers entertaining the crowds. A large Festival Bar and producers selling delicious street food provided party-goers with plenty of sustenance for dancing the night away to the live music acts. Other features included the Festival Question Time with BBC Radio Devon and the Westcountry Bakery offering visitors a host of entertaining and informative demonstrations and debates. The Darts Farm teepees returned once more with a timetable of fascinating and tasty workshops from cider pairings to sausage making. Exeter Festival of South West Food & Drink returns for its 15th outing next year on 5th, 6th and 7th May – the early May Bank Holiday 2018.